Aashna Anand from Delhi, B.B.A Graduate. RECRUIMENT PERFECT COMMUNICATIO.. PERFORMACE MANAGEMEN.. GRIEVANCE HANDLING COMMAND OVER COMPUT..
are one of expert skill area's of Aashna Anand . 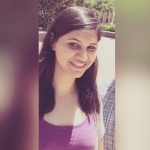 Aashna Anand is working in Health Care industry.